Steam’s premier single-player survival sandbox is now to be the proud host of online multiplayer with persistent player-run servers. Tests suggest player counts of 10 or 12 will be easily manageable via domestic inter-magic cables, and that players will be able to run the game online using the same sets of mods they’re playing with now. Ace. But why multiplayer now, when NPCs are still very much in larval state? “We need to make clear that this in no way impacts the Indie Stone’s massive focus on single-player for this game,” say the Indie Stone – and they really ought to know. NPCs are still “very much” in development – at least one member of the Project Zomboid dev team is solely dedicated to single player writing and scripting. 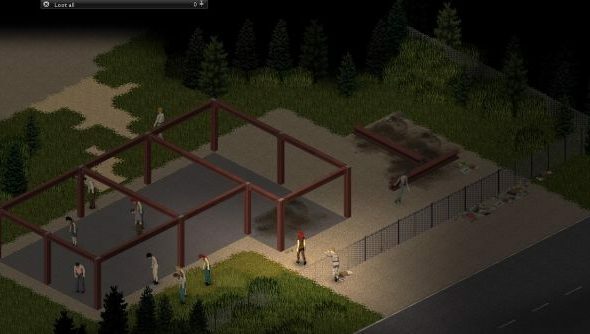 But since the game appeared on Steam, it’s become apparent to the Indie Stone that the a large segment of the PC-owning population not yet bought into Zomboid is mainly put off by its lack of multiplayer support. And so work began on multiplayer – first during Christmas two years ago as a rough test, and more recently as a serious feature that came together so quickly that it took its team by surprise. As NPCs (“the feature that PZ will live or die by”) became a more complicated job that the Indie Stone had anticipated, multiplayer managed to overtake it in the ‘releasable feature’ stakes – and so here we are. The devs won’t offer anything so solid as an ETA – but suggest a multiplayer update is “not far off” – and to be followed by integrated split screen functionality. In the long term, the Indie Stone would like to see their much-sweated-for NPC feature set live in harmony with the surprise multiplayer component. So that’s what this is: a very welcome and well-explained new side dish to Project Zomboid. Is it something you expect to play with?